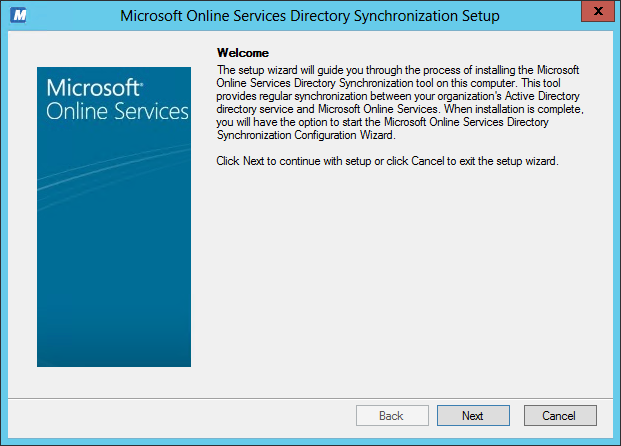 This post will explain how to setup the DirSync tool that will synchronise your internal AD accounts across to the Windows Azure AD platform for usage by Intune and other online services such as Office 365. 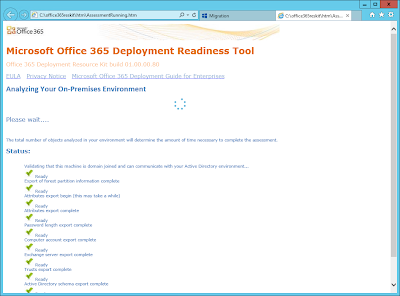 It's important to note that if you already have this setup for an O365 subscription you don't need to do this again just for Intune and vice versa for a new O365 if you already have Intune. 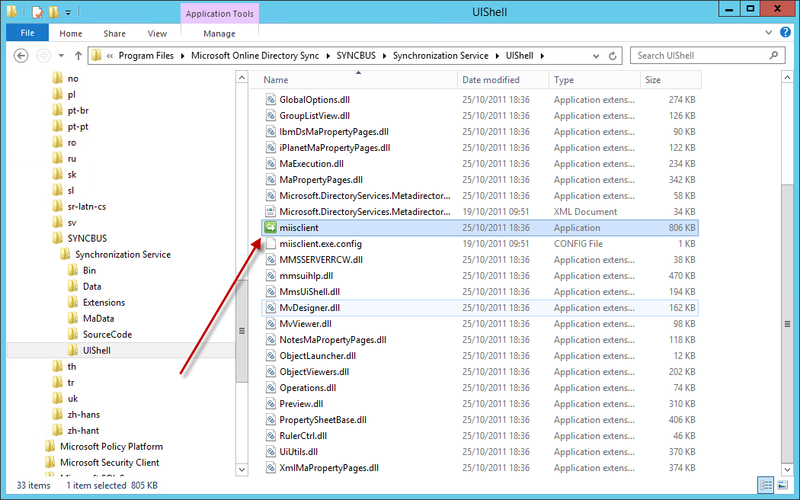 Just as a bit of background, you may want to read this link to see just what is Windows Azure AD Tenant? This link will allow you to download the DirSync Prep Tool which will perform a series of checks across your domain to find any potential problems. 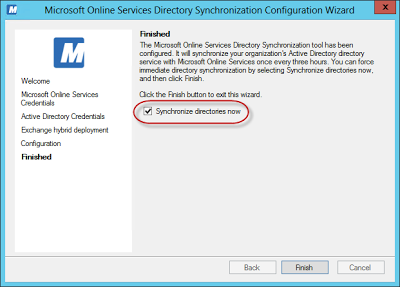 Running the Prep Tool will start the analysis for Office 365, but 99% of the rules apply to Intune in terms of Directory Synchronisation. When it's complete, review the report and correct anything that might cause a problem. 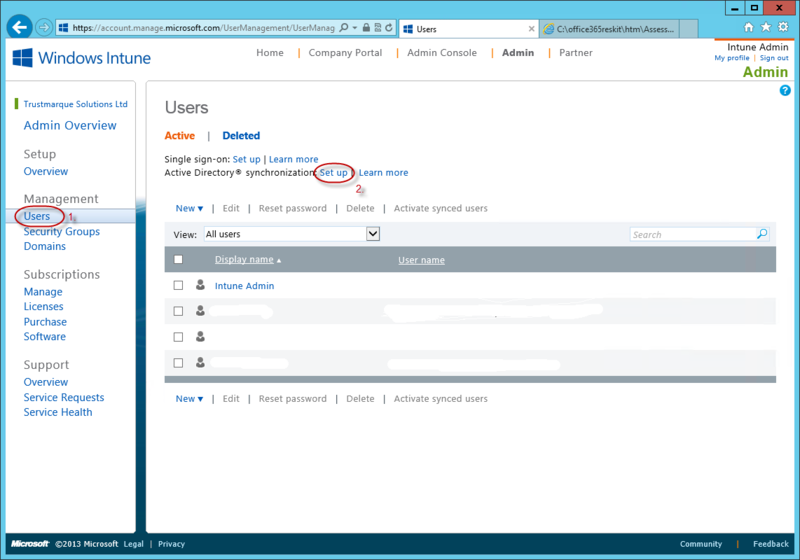 Once your happy that you're ready to go, Login to the Intune account portal at https://account.manage.microsoft.com and Click on the Users link on the left under the Management grouping. 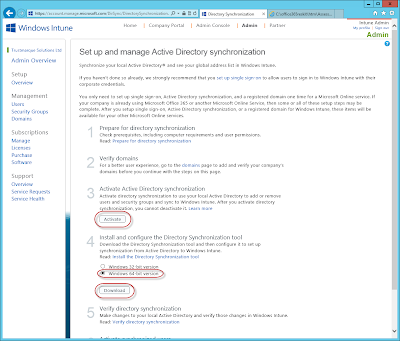 Back on the main users page, the Setup link next to the Active Directory synchronisation text should now say Deactivate. If not it may still be setting up in the background. 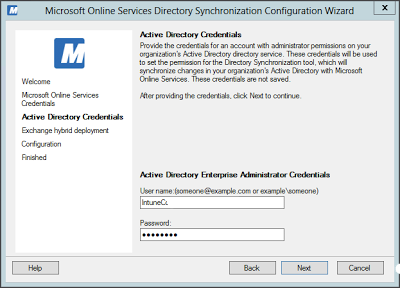 To allow your users to logon to the Company Portal later on, they will need an account that matches the Universal Principal Name (UPN) of the accounts that ConfigMgr knows about. 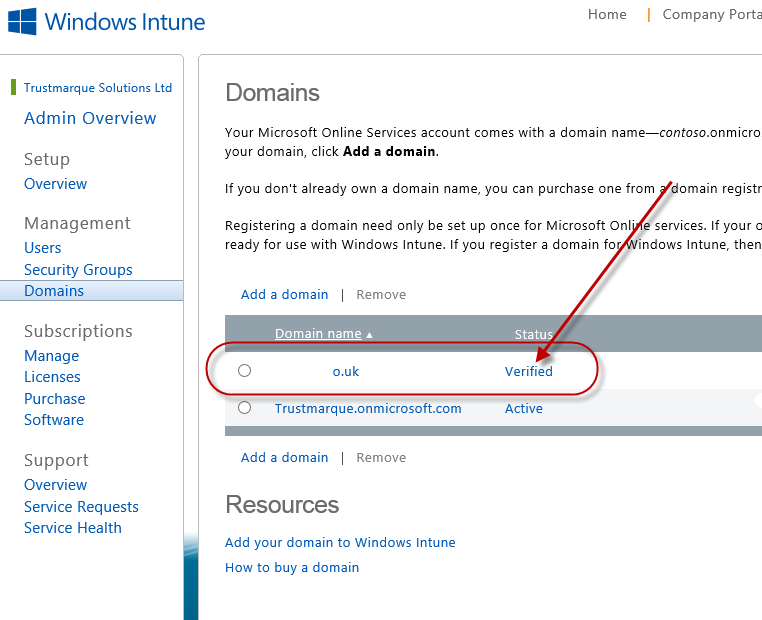 This requires you to add a domain to the Intune portal and then verify it to ensure that you do indeed own the domain name. You'll then be presented with some methods of verifying your domain, usually by adding a TXT entry to the DNS records or by changing your MX record. 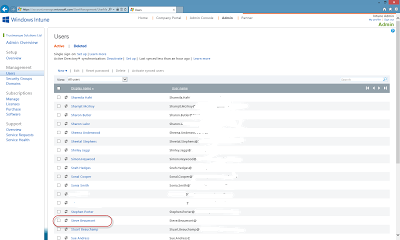 All things being good, you should then see your domain as verified. However, sometimes things never go smoothly. 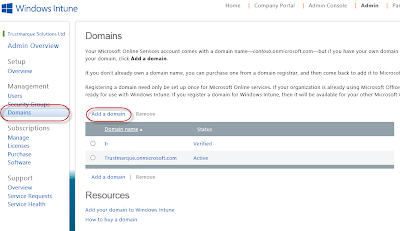 Certain domain registrars such as 1&1 don't accept the MX record method as it's not a registered TLD. 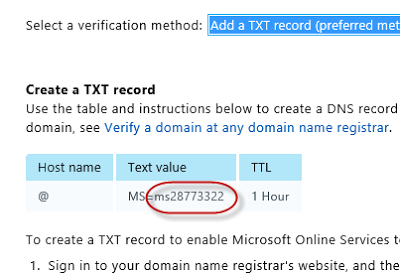 They also don't allow you to add TXT records to your DNS. 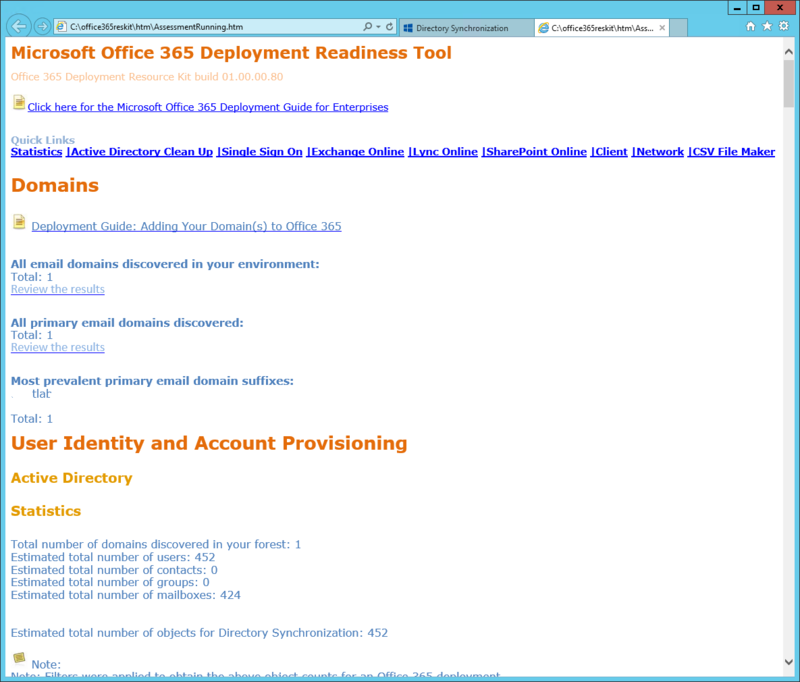 Thankfully Todd Douglas across on the O365 forums posted an alternative method. 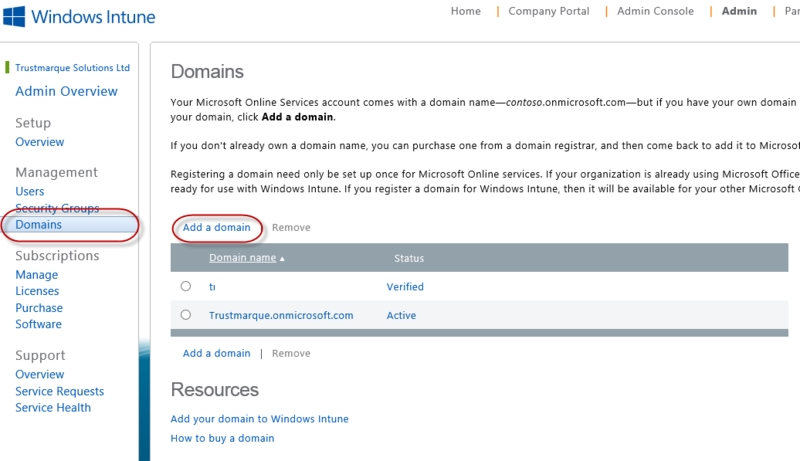 Using this method you basically you create a subdomain within the 1&1 control panel using the ID ringed as shown in the screenshot as the subdomain name. 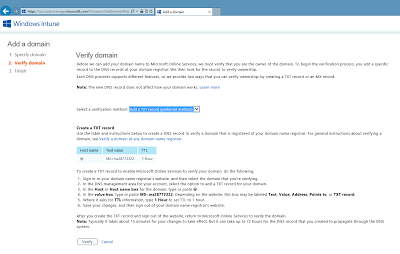 You then add to this subdomain a CNAME that points to ps.microsoftonline.com and when done, you can verify your domain fine. 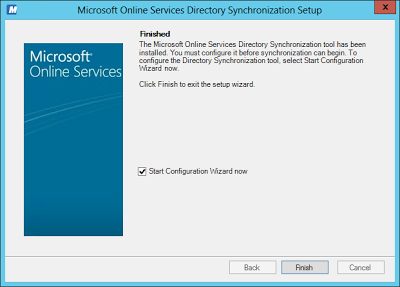 Once your domain is verified, it's time to install the DirSync tool. 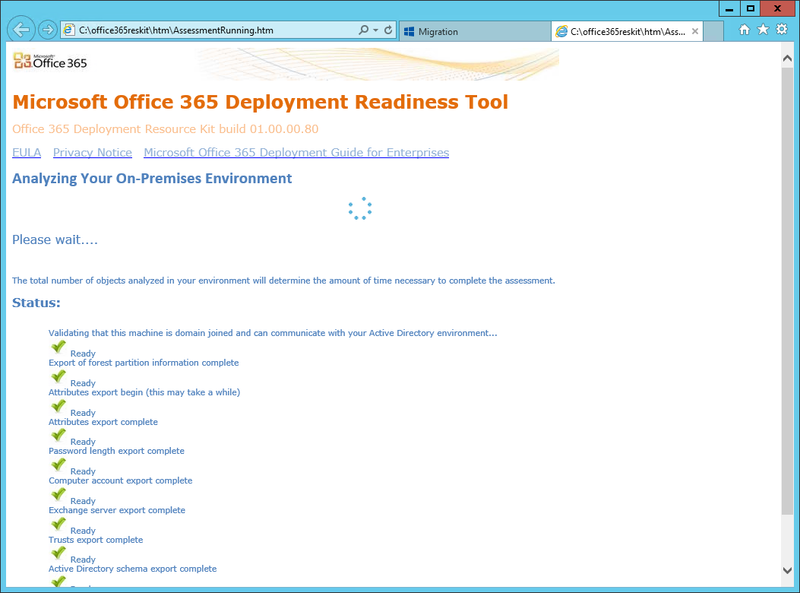 This tool has some specific requirements for the account running it. 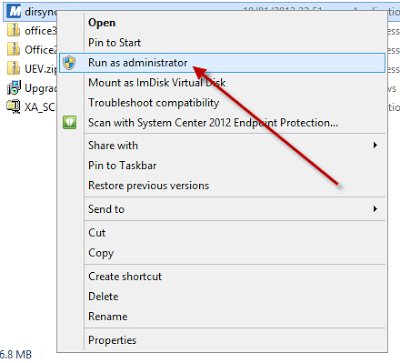 The account installing it must be in the Enterprise Admins group. 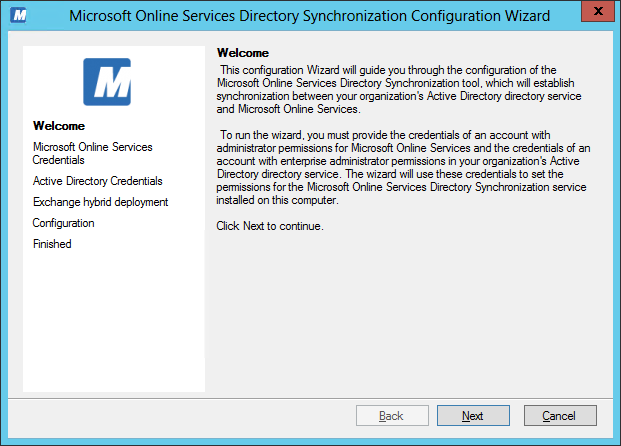 The Enterprise Admins group membership is temporary only and is just used during setup to create a service account in AD to be used by the sync tool going forwards to read AD. This is because you must right click the installer and choose Run as administrator. 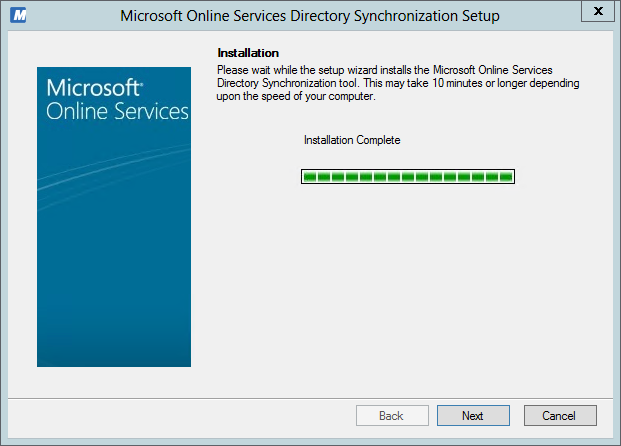 Step through the installer, there's nothing really in the way of configuration options to worry about. Review the Welcome screen and then Click Next. 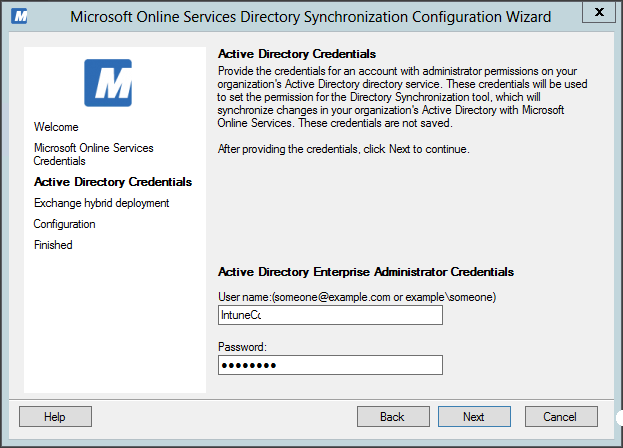 Supply the credentials for an account in Intune that has permissions to create accounts. N.B. 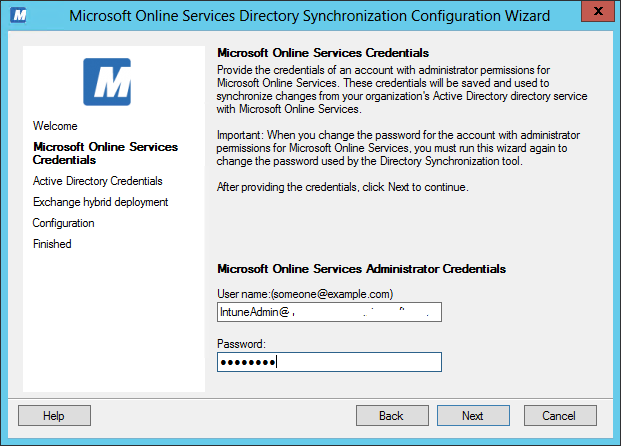 I would advise manually creating a dedicated account for this in the Intune accounts management portal. 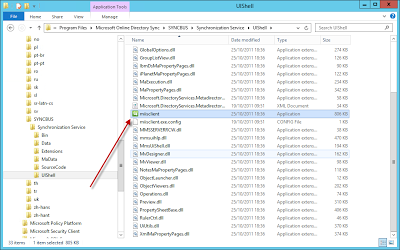 Don't be tempted to use your account or the one created when you first setup the service. If at this point you get a Configuration error message, check in the account management portal that AD Synchronisation has finished setting up and then retry. 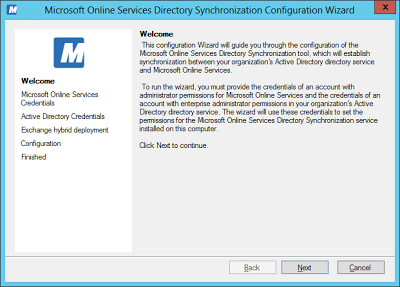 Supply the credentials for the account in your AD that has admin rights. 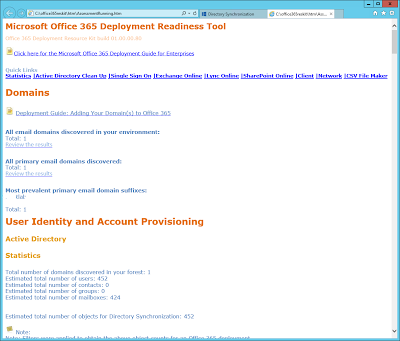 The documentation says it needs Enterprise admins rights, but you might get away with just domain admin rights. This step allows you to start setting up an Exchange hybrid deployment. 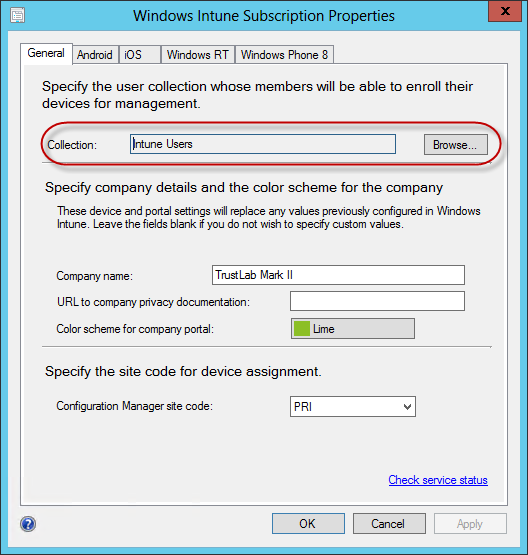 I'm only interested in getting Intune working at the moment, so I'll skip this bit. 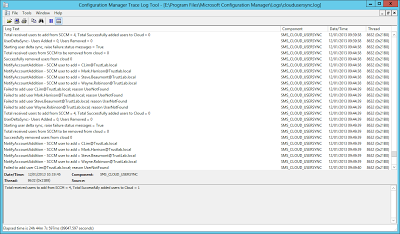 Configuration doesn't take long, Click Next when it completes. 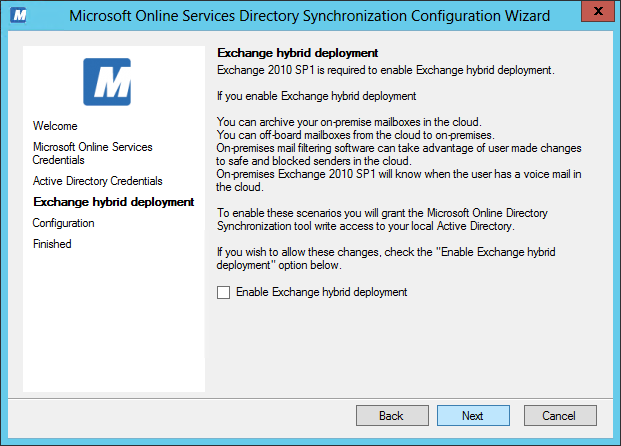 A message box will pop up with a link to some online information regarding verifying the sync is working. Click OK. This will open a console (look familiar?) 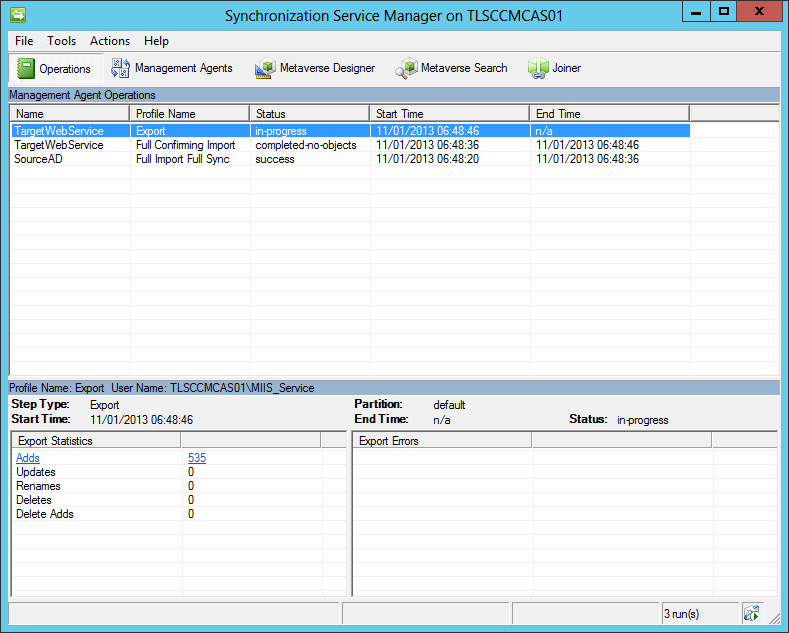 and you can easily check the status of the sync. 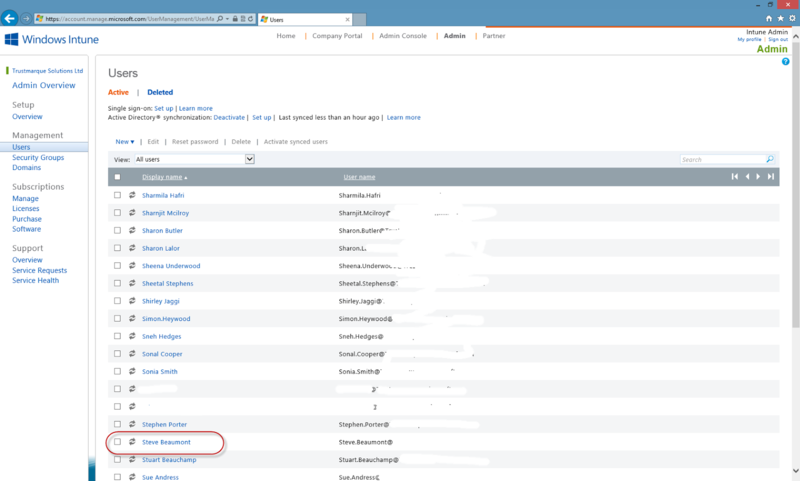 After a little while, depending on the size of your AD, spec of the sync server and speed of your Internet connection, you should see some accounts start to appear. That should complete the setup of users within Intune. Users that are allowed to enrol mobile devices is controlled within ConfigMgr by the properties of the Intune Subscription and selecting a collection. 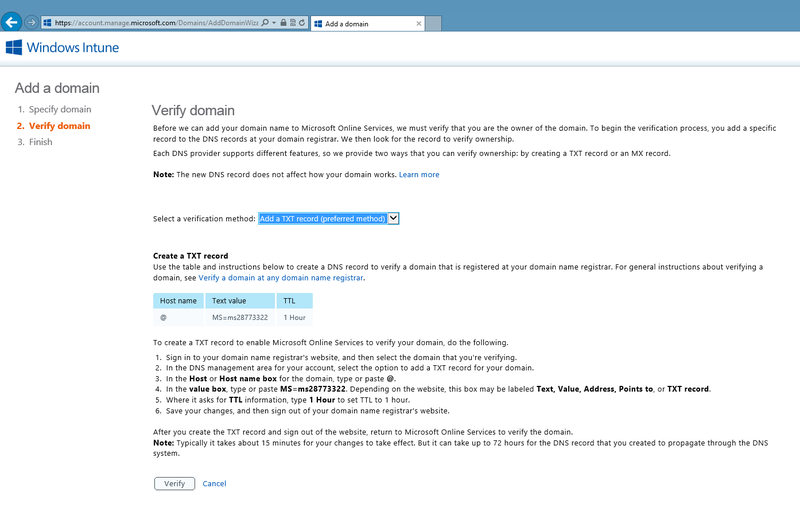 One of the first problems I ran into when setting this up in a lab environment that I hadn't hit elsewhere, was the fact that my internal domain name didn't relate to anything externally verifiable. 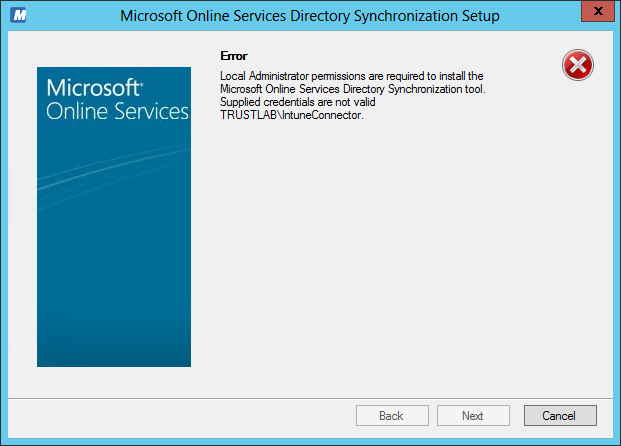 So while I do own an external domain name, my lab is using trustlab.local as it's domain name which bears no relevance to my external name. 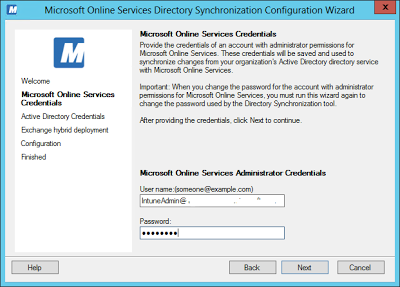 This also mean my user accounts Universal Principal Names (UPNs) didn't match the accounts created in Windows Azure AD. 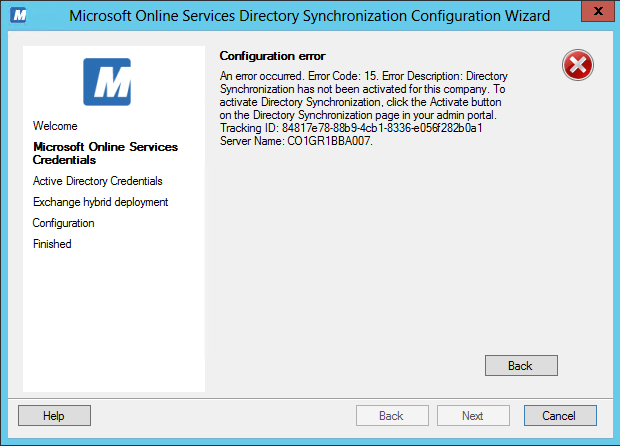 This meant that after setting up my Subscription and the DirSync, none of my test users could access the company portal on a mobile device (https://m.manage.microsoft.com), just getting a message than an error had occurred. 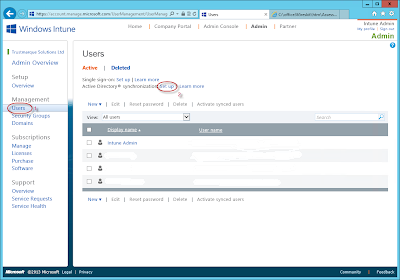 That's because my UPN's for those accounts don't match with the accounts within Intune. 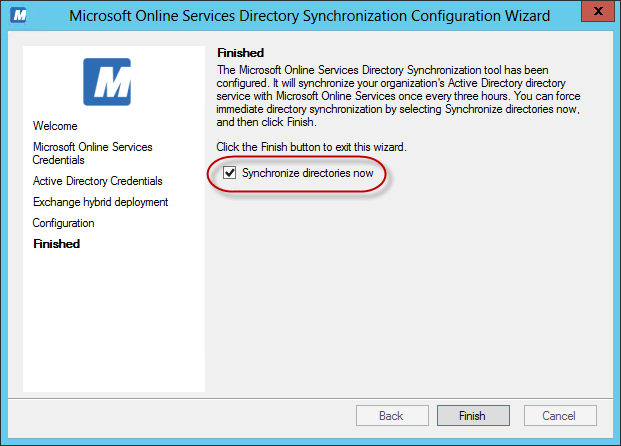 With a verified domain in intune, but no matching UPN, the dirsync tool will do the same as above. 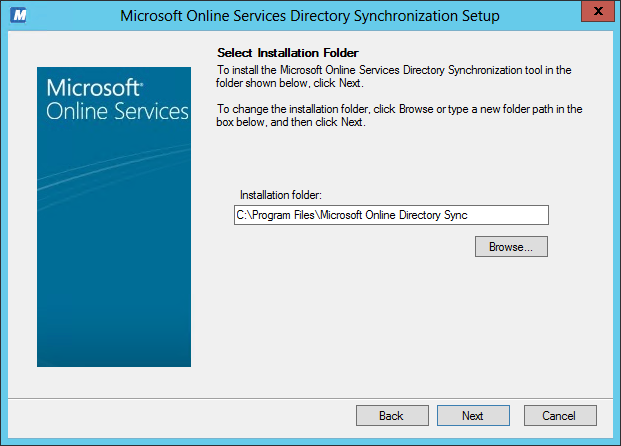 They only way around this is to have added an additional UPN to the forest/domain and then change those accounts to use the new UPN BEFORE you setup the DirSync tool. 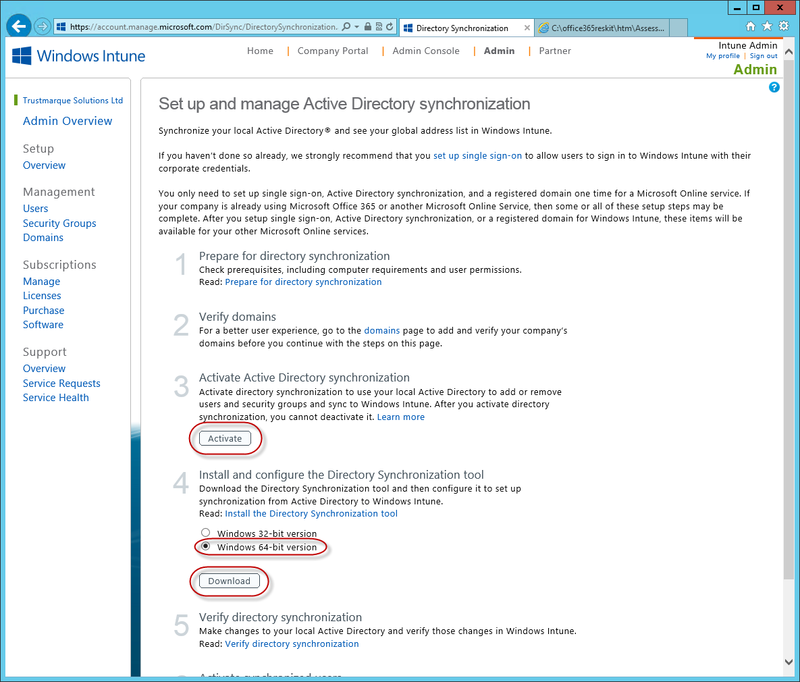 If you've already setup the sync tool, then you won't be able to delete the account from Intune and you will either need to deactivate the AD Sync and then manually remove the accounts from Intune and then re-activate the sync or delete the account in AD, let it sync and remove it, then re-add the account with the matching UPN. In short, your domain UPN MUST match a verified domain that has been added to Intune. Thanks must also go to Craig Morris at Microsoft for confirming my thought process on the UPN mismatch issue on this one. Keep an eye out for some blog posts from him also coming soon on this subject. About the UPN, I did the same as you did. 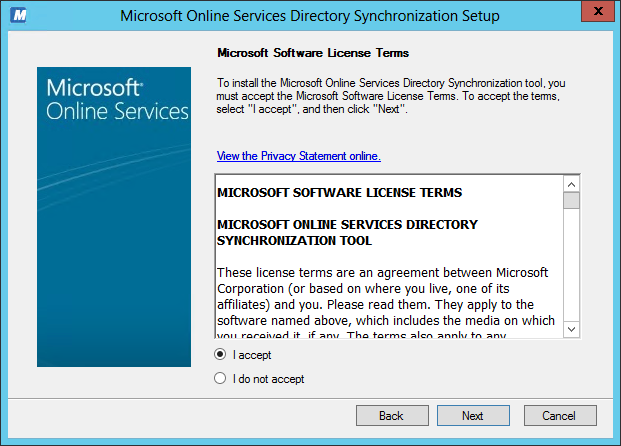 Then I added an UPN via Domain and Trust for my external domain. 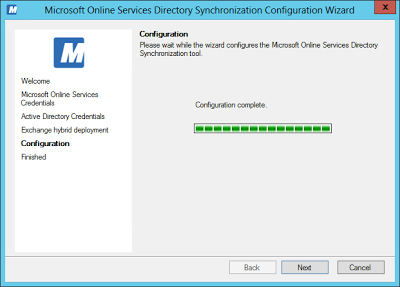 Changed my user UPN to reflect my external domain. 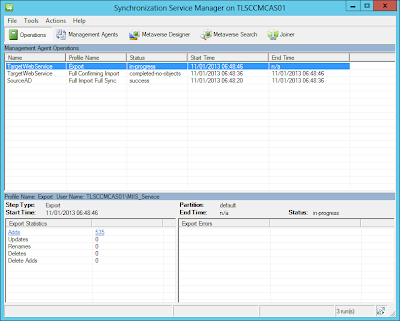 Started back a sync and all went OK. 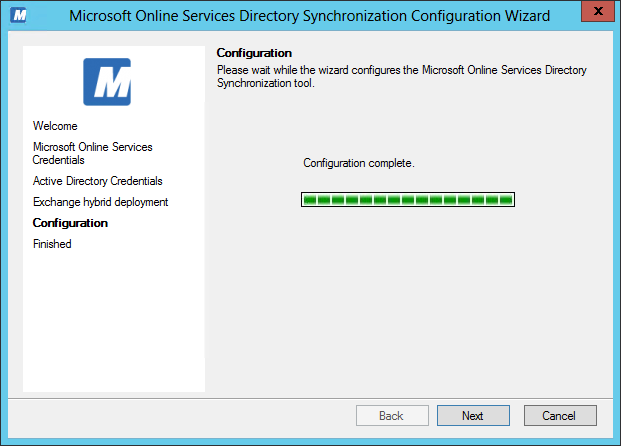 I have a server in Azure that SCCM installed the basic client with forefront end point protection and I cannot install DirSync. 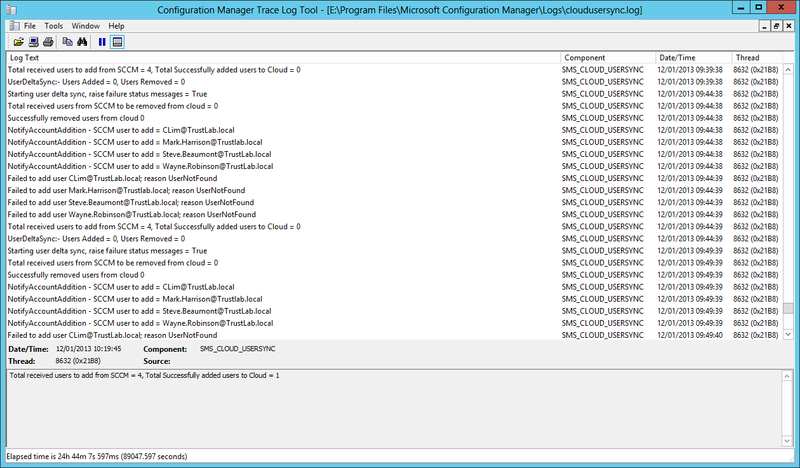 I get an error to reboot the server and the following log. I am trying to enroll iOS devices but the iOS enrolment process failed with "unanticipated error"' I have double checked and verified that UPN is OK, someone faced the same iss`?